Quite often, booking a package holiday is the cheapest way to get flights to a certain destination. Even travelers, people who would enjoy a backpacking trip around Tunisia a lot more, might get tempted. But baking in the sun all day long, taking part in animated activities and listening to talks about the dinner buffet day after day is not everybody’s dream of a perfect holiday. Of course, it can be nice to relax for a while and to enjoy sleeping in fresh white linen of a multiple star hotel. I seriously had worse nights in some flophouses while backpacking around the planet. But when me and my partner were on a package holiday in Tunisia in July 2014, we realized quickly, that we would like to travel around Tunisia a bit. We urgently wanted to leave the well blown-up tourist bubble for a few days. We still enjoyed the comfort, the food, the free sunbeds right at the ocean and the idea not to worry about anything too much (we went there in 2014). It was the first time, that we were on a package holiday. But in our hearts, we are travelers. And we were far too curious to stay behind some pool fences. 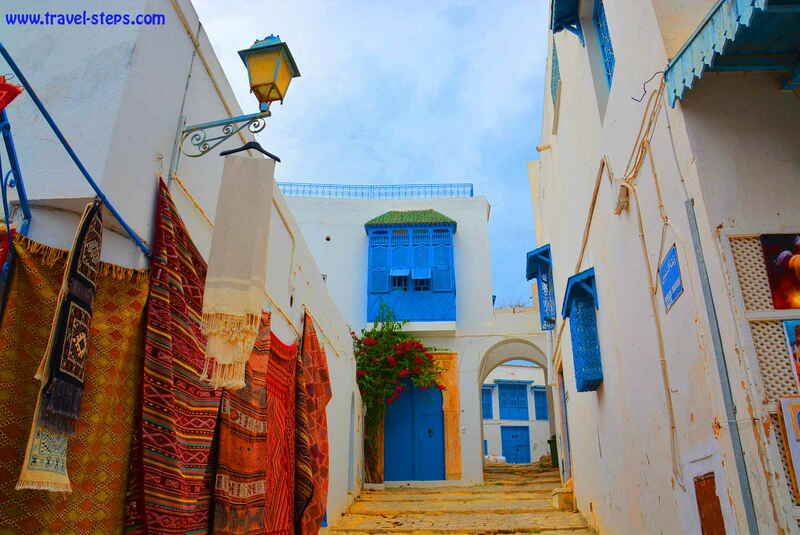 And it was easy enough to escape to Tunis and Sidi Bou Said without booking the expensive tours offered by the hotel. We had booked an extremely cheap last-minute holiday in Hammamet Yasemine/Tunisia. Well, we knew, what was coming. And we took it with serenity. 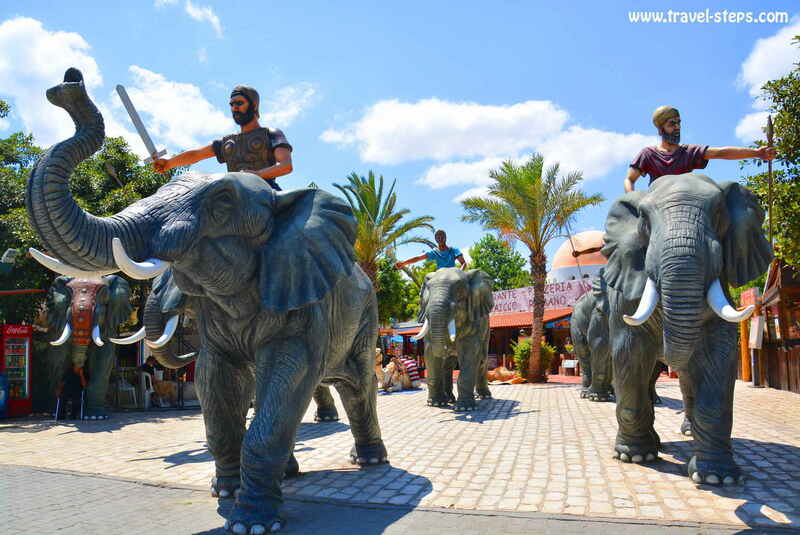 Hamamet Yasemine is probably the most artificial place in Tunisia – created just for tourists. Concerning the unemployment rate of 14 percent in 2016 and the fact, that a lot of people in central Tunisia still live in severe poverty, the whole place is a joke. 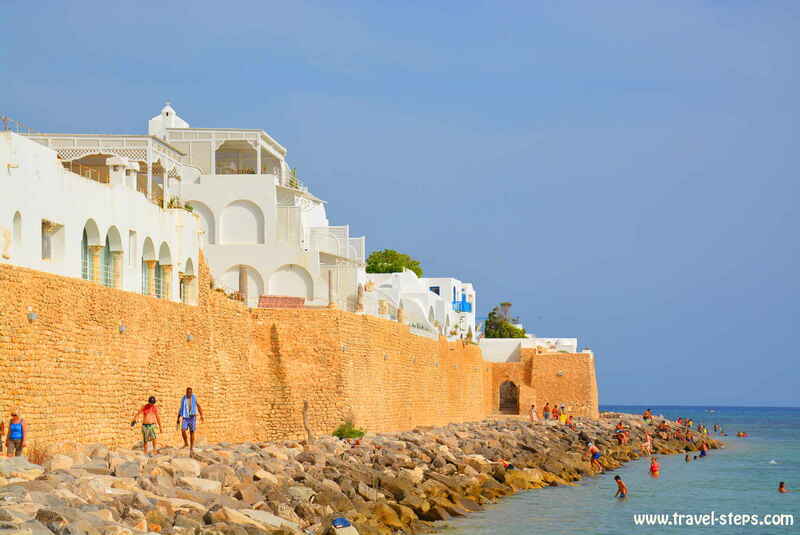 The resort town of Hammamet Yasemine in Tunisia consists of three to five-star hotels set around an artificially built medina with shops and restaurants close to the Mediterranean Sea. 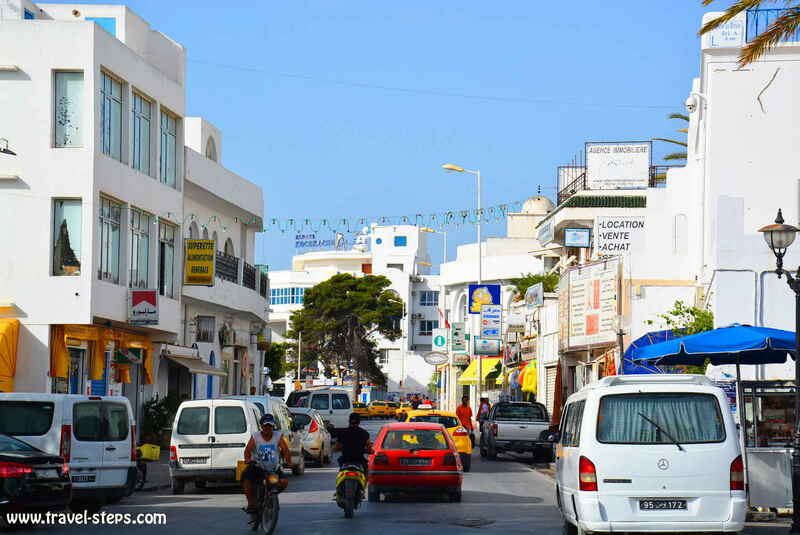 In Hammamet Yasemine, you see basically just tourists in the streets. No real life. 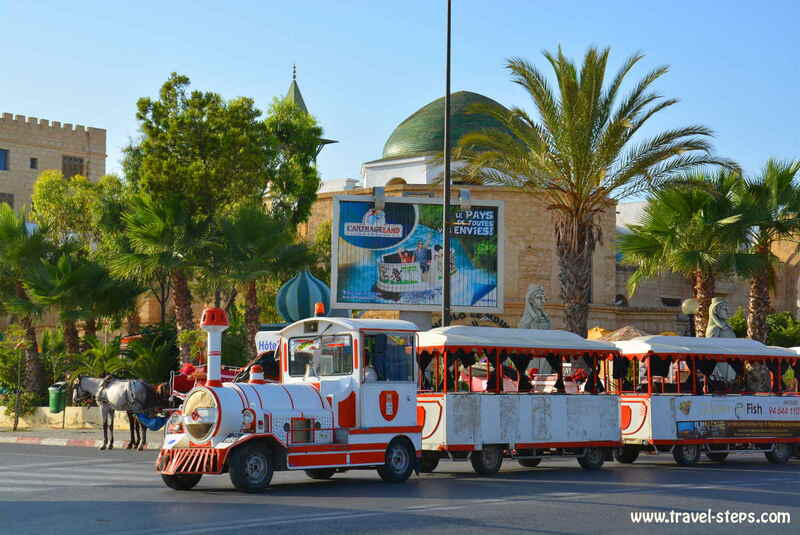 There is even a miniature tourist train, that takes the tourists to the old town of Hammamet. For everyone, who wants to safe money, meet at least the locals, who work in and around the hotels and to keep some traveler’s pride, there are also real local buses running the 20 minute trip from Hammamet Yasemine to the “real” Hammamet. Yes, there exists a small town with a beautiful medina not far away. It has a nice vibe. You can hear the prayer calls, feel the busy life. But tourists still need to be tough not to go crazy among all the pushy salesmen in front of their souvenir shops. In general, prices for food and water are much lower there than in Yasemine Hammamet. Marrying girls from western countries? While traveling in Tunisia, we met two young Tunisian guys in the bus from Hammamet to Hammamet Yasemine, who told us about their lives, their unemployment, their dissatisfaction, their attempts to marry girls from western countries – torn between looking elsewhere for a better future in material wealth and the love for Tunisia. Still, they were not able to hide their laughter, when two young fat tourist girls entered the bus, dressed in skimpy hot pants and with some scarfs on their heads. It’s almost impossible to get stuck somewhere around the Mediterranean coast in Tunisia on a backpacking trip around Tunisia. Even, if it is not obvious at first sight in the tourist center, be sure that buses, mini buses and trains are not far. Of course, with limited time, it is always difficult to start a crazy trip around Tunisia. But there is no need to feel stuck in a package holiday in case, it is not completely yours. Tunisia is clearly not obviously set up for backpackers, but the infrastructure with hotels and public transport allows travelers to get around the country independently without any problems – at least in the north and around the Mediterranean coast. To get out of our tourist resort in Hammamet Yasemine, we went by taxi to the train station Bir Bou Rekba, which is located 5,7 kilometers away from the resort town of Hammamet. 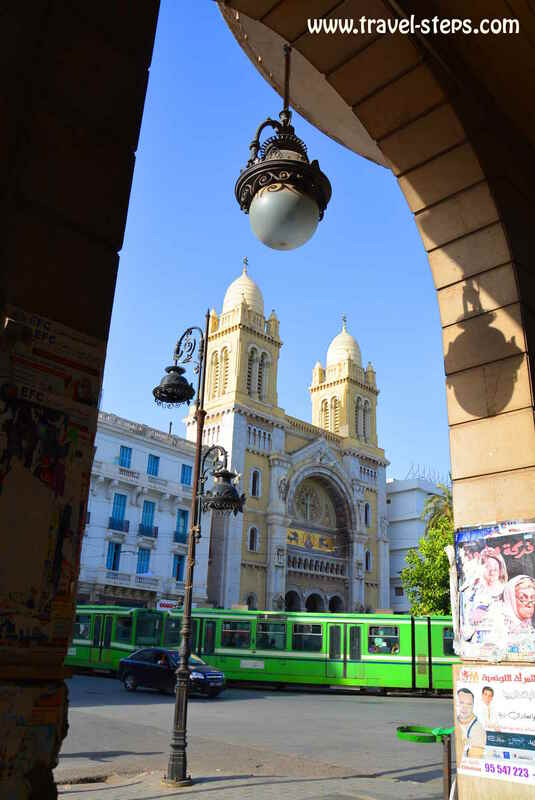 From Bir Bou Rekba, you can catch direct trains for example to Tunis, Monastir or Sousse. There is one line connecting all these towns multiple times a day. The webpage gives a helpful overview about train connections in Tunisia: www.seat61.com. At the train station, we bought our tickets from Bir Bou Rekba to Tunis at the counter. We were surprised, when an air-conditioned modern train arrived and took us right to Tunis city center. The ride took around one hour. It was tough to find seats as the train was pretty crowded with locals and some tourists, who also liked to discover the country individually. 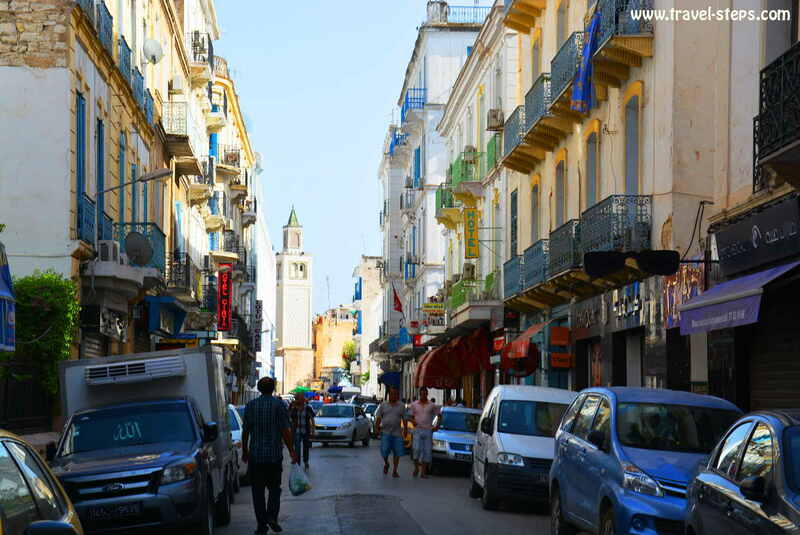 When we arrived in Tunis, we immediately felt the different atmosphere to our artificial resort town. It was busy, crowded and real. Be aware, that there is a more conservative dress code in Tunis than in the beach resorts. No local was wearing shorts or short skirts. Everyone had at least his or her shoulders and legs covered. And a lot of tourists were easy to recognize. Our plan was to travel to Sidi Bou Said first, one of the most picturesque small towns at the Mediterranean sea in Tunisia. There was a local train running from Tunis to Sidi Bou Said, which started right in front of the train station. It was easy to find. Helpful staff told us, which ticket to buy. Sidi Bou Said is said to attract masses of artists and tourists at the same time. It is pretty commercial, but the architecture and the whole setting is still beautiful to experience. 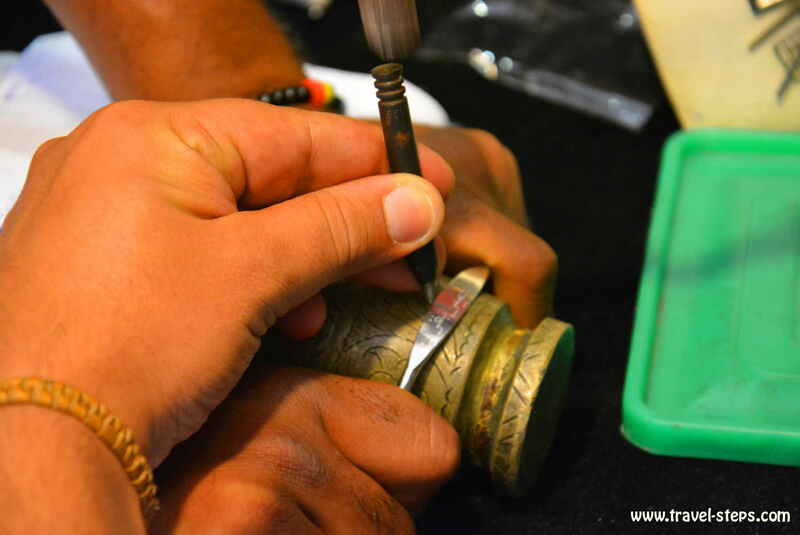 It makes sense to try to haggle down prices for souvenirs up to 90 percent. What you experience and who you meet, how you feel and in what kind of way you make the most of tourist destinations always depends on yourself. The train line Tunis-Goulette-Marsa called TGM, connects Tunis und La Marsa. 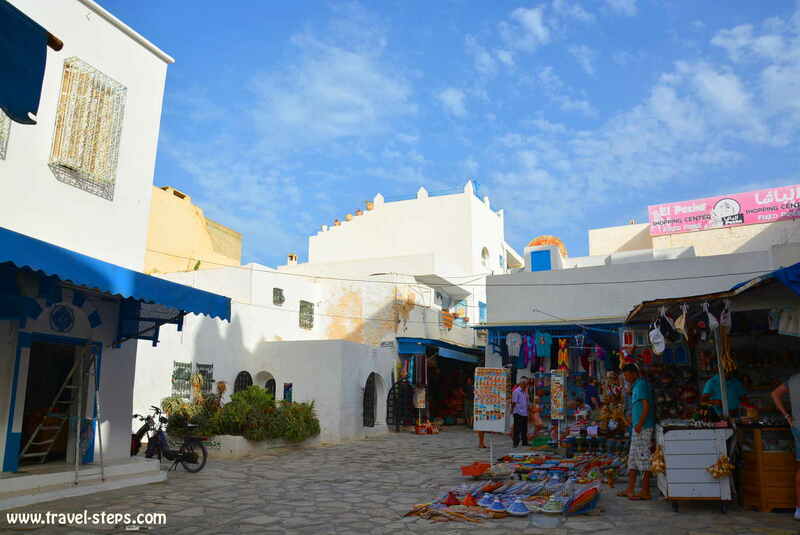 It stops at all the interesting stops for tourists like Carthage and Sidi Bou Said. The whole list of stops: Tunis Marine, Le Bac, La Goulette, Goulette La Neuve, La Goulette Casino, Khereddine, Aéroport, Le Kram, Carthage Salambo, Karthago Byrsa, Karthago Dermech, Hannibal Karthago, Carthage Présidence, Karthago, Amilcar, Sidi Bou Saïd, Sidi Dhrif, La Corniche, Marsa Plage. Between 3.30 in the morning till midnight, there is one train every half hour. In Sidi Bou Said, the train station is located in walking distance from the historical center. You just need to walk uphill a little. In Sidi Bou Said It was a problem to find affordable accommodation for individual travelers spontaneously. The room prices are certainly much higher than in the less picturesque beach towns around. We still tried to find an affordable place. After we had checked at few of the available beautiful hotels, we walked into a small hotel and explained honestly, that we were traveling on a budget and that we were looking for a cheap place to sleep. The guy working at the reception understood immediately. He smiled at us and he really made an effort to find a room for us at a private house. Just one phone call and a few minutes later, we arrived at a private room. A lovely lady opened the door. We were allowed to sleep in her son’s room, who was away working in a different city. We were surprised to find the room decorated with US flags and pictures of American actors. All his clothes were still in the room. But we were right in the historical center just five meters away from our private viewing point. And the lady was super friendly, spoke perfectly French as most Tunisians do. She even prepared a breakfast for us the following morning. At night, she went out to celebrate in the street with some neighbors. We were in Tunisia during the month of Ramadan. Traveling during Ramadan meant, that life during the day time was pretty slow. But tourists on package holidays were not in danger to starve. Although or especially because there were not many western tourists around, the waiters of the tourist restaurants went out of their way to get us into their places. Local restaurants were often closed during day time. And the Tunisians ignoring Ramadan were hiding away in houses and cafés, where we were surprised to find quite a few young men smoking and eating. But as soon as the sun had set, the vibrant life in Sidi Bou Said started. 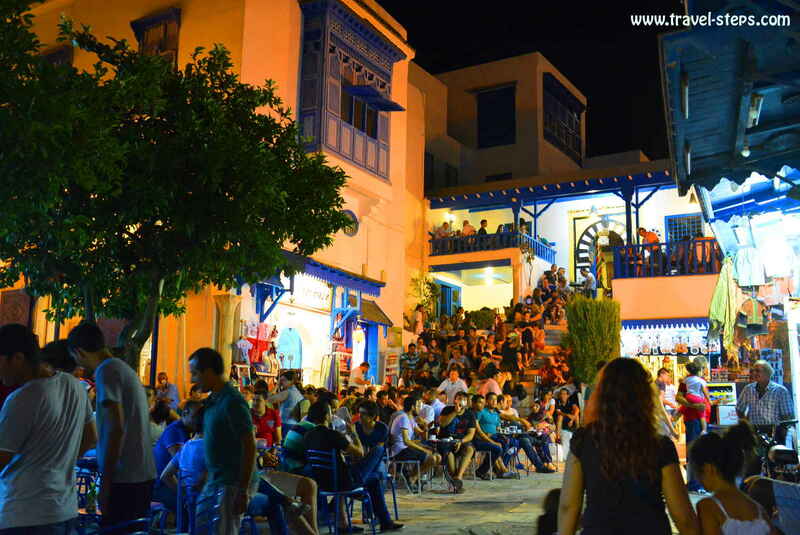 After sunset, the streets in Tunisia were suddenly full of people, the shops and restaurants open. We experienced the same in Hammamet and Sidi Bou Said. At night-time, we felt a great atmosphere basically in all towns. Life took place in the streets. Young couples and families went out for walks, bought sweets, sat down in cafés for non alcoholic drinks and tea. The peaceful and joyful atmosphere was great. In Sidi Bou Said, you could buy sweets and Yasemine flowers in the streets. It was a beautiful atmosphere. I enjoyed it very much to sit in a café and just to watch the people. 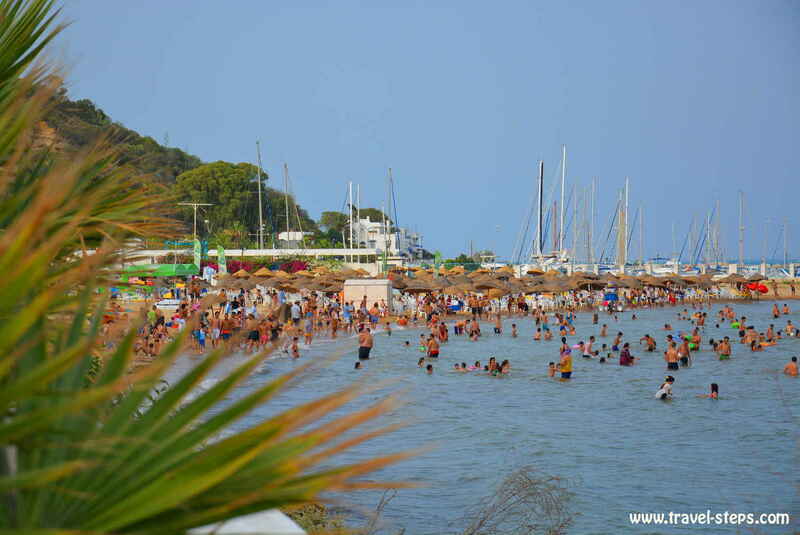 There were also a lot of rich Tunisians and French on holidays, quite a few owned own flats and houses in Sidi Bou Said. Fancy cars were parking outside the historic town center. 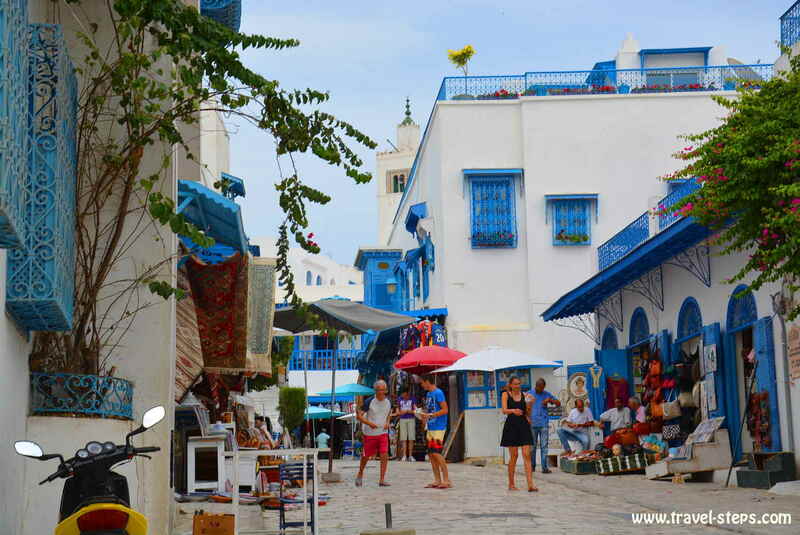 Sidi Bou Said certainly is a tourist destination, that attracts better off people. At least, you see there a different crowd than at the local markets in Tunis. I was surprised to see even a few women in short skirts and high heels in Sidi Bou Said. People were enjoying themselves till late. There was a lot to discover in Sidi Bou Said. Art galleries in small lanes, mosques, white houses and flowers under blue sky, beautiful viewing points, that offered amazing views of the sea. Sure, there were a lot of souvenir shops. But the locals were extremely relaxed and not pushy at all. Still, it is probably not wort buying souvenirs there as you have to haggle them down a lot. My impression in Sidi Bou Said was, that people are used to tourists with full wallets. We saw quite a few tourist tour groups following some guides with umbrellas during the day time, but they had all been gone back to their hotels by late afternoon. Sidi Bou Said also has a beach. There are stairs leading from the historical city center right to the sand and the waves. Umbrellas and sun beds were for rent. And for a few coins, you can even have a shower at a separate building. We were the only western travelers at the beach. Around us: Large Tunisian families. Most local girls were wearing long shirts in the water. But a few even went into the water in bikinis. Sidi Bou Said beach definitely offers a different atmosphere than at the secluded hotel beaches, where authentic life doesn’t take place. And we didn’t feel comfortable drinking openly water during the month of Ramadan. We always tried to drink secretly, when no one was around, because we knew, that a lot of people around us were having a tough time in the heat without drinking. No idea, if anyone really cared at all about us or our behavior. Probably not really. We were travelers from Europe. When we stopped in Tunis on the way back to Hammamet Yasemine, we were even hiding behind a wall to have some fizzy drinks and water, that we had bought at a supermarket. It was very hot. And I was so thirsty, that I was already shaking. Well, we did our best to respect, that other people around us were doing Ramadan. But we were too weak not to drink and eat at more than 30 degrees Celsius outside. We were wimps and simply not used to that temperatures. Ramadan was probably one of the reasons, why our holiday package had been so cheap. Well apart from that Tunisia suffers from a decline in tourism anyway. Anyway, it was a bit amusing to see, that even some locals not being so close to Allah, had some problems. More than one time, we smelled, that men were hiding away for a smoke in train toilets. In Tunis, we felt a cosmopolitan flair. It still is a city of contrasts. Fancy shops and small markets close to each other, mosques and churches in the city center. In front of French colonial style buildings, there were covered women walking next to heavily made-up ladies. But Tunis is probably a good place to get a few bargains in the small lanes of the medina filled with souvenirs. We enjoyed walking around and didn’t care so much about the typical sightseeing even if the National Museum, the medina, the Cathedral of St. Vincent de Paul, Zitouna Mosque and the catacombs are said to be worth a visit. Another downside during Ramadan: Trains and buses very often follow different schedules. Local buses often don’t run during dinner time. It’s one thing, that you better check in advance. The good thing about Tunisia: There still always seems to be a solution to any transport problem. When we realized at the train station, that there was no train running back to Hammamet in the early evening, people sent us to a bus station, where minibuses were waiting for passengers. They left as soon as enough people were in the car. It was even cheaper than the train. It was a 20 minutes walk away from the train station to get there. And another five minutes later, we sat in the right mini bus to Hammamet. We still arrived there before the muezzin called. While traveling in Tunisia, it was fun to realize, that a lot of locals in tourist towns have been practicing the same scam for around 20 years. You can read about it even in travel guidebooks printed in the 1990s. Random people suddenly show up claiming, that they are the chefs of your hotel. It is ridiculous. They try to get you into a conversation. If you get into it, you will end up for sure in a shop of a friend’s friend, of a cousin’s cousin or whatever. It’s slightly nerve wrecking. This way, people play with the tourists’ politeness and push them into buying something. The first time, when a “cook” of our hotel came up to us, we were slightly embarrassed, that we didn’t recognize him. When he wanted to show us around the medina and when we ended up in his brother’s shop, we understood, that this guy had probably never seen a hotel kitchen from the inside. He was a complete stranger. Well, it was not harmful, but we felt stupid and didn’t feel like buying anything of this guy. The following days, we were just laughing about dozens of guys who came up with the same story. To the surrounding towns of Hammamet Yasemine, there are bus services available. 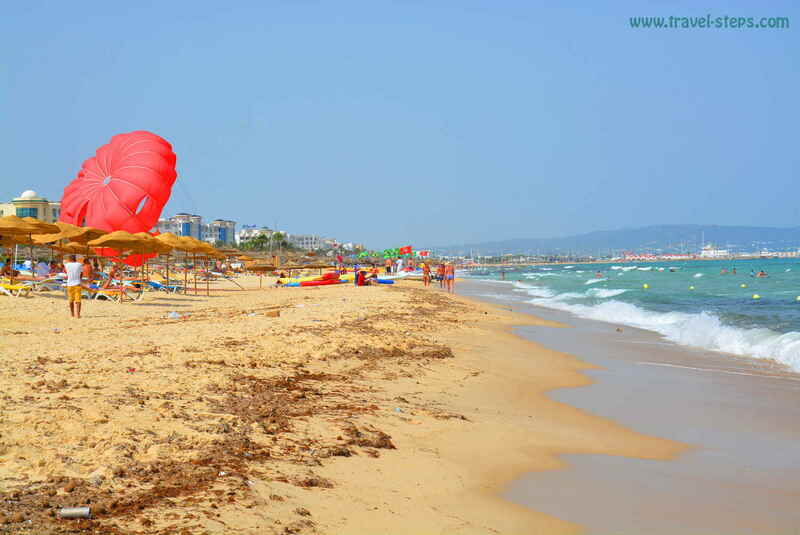 Within 20 minutes, you are in the old town of Hammamet with its old medina and surrounding shops, markets, local eateries, the public beach and tourist restaurants. The trip in the local bus just costs a few cents. And certainly every local knows, where and when to catch it. From Hammamet, there are also buses going to the surrounding towns, perfect for day trips from the hotel.